The Crew Custom Holsters OL' Classic OWB is your standard outside the waistband holster. It is manufactured from some nice heavyweight kydex or similar plastic. The one I received is for a full size 1911 style pistol. It arrived in black. I tried it with 2 different 1911's and it functioned flawlessly. The design of the holster would make it very useful for everyday carry, IDPA, hunting, or any other thing you might want an outside the waistband holster for. The belt loops supplied fit my 1.5" belt nicely. The loops are also kydex, and are very deep, meaning that a really thick belt, or one of the double competition style belts, will fit through the loops. The loops can also be adjusted up or down on each side. This way, the holster can be lowered, raised, or adjusted for cant. Being that it is for a 1911, the inside sheet of kydex came up just to the safety lever. The outside piece is a little lower to help you get a good grip when drawing. This model OWB holster also covers the trigger guard completely. It is also molded around the mag release button so that it can't be hit accidentally. Some of the owb models have adjustable retention, this one does not. I didn't find this to be a problem, as the holster retained the firearm nicely. The draw stroke is also very smooth. Upon reholstering, you do get a good "snap" as the holster locks the gun in place. I did notice that it took a few draw strokes to break in the holster, as it was very snug when I first received it. This holster is really nice. It is available in lots of colors and patterns, for a few extra bucks. There are also options for weapon mounted lights and lasers. Various belt clip options are also available, as well as a sweat guard, if one wishes. The only flaw I found with this particular model was that, with one of my 1911's, the safety would just touch the holster so that the firearm would not go in completely. I mean by maybe an 1/8". So I just filed that spot down slightly and it worked great. I called The Crew Holsters about this and they said I could send it in for them to fix, because it does have a lifetime warranty. They said they would look at the problem and I doubt that it exists anymore. If you're in the market for a good kydex style holster, give the Crew a call. What other aesthetic options or finishes are available? Lots of different colors, patterns and options. "I've ordered a few of their iwb holsters and i think i found the last holster company I'm going to deal with, the owner is cool and prices are damn good, and the product is good, speaking of which i need to order a iwb for my sig." I have been shooting and owning firearms for over ten years now, yet I have never kept a firearm for home defense. About a year ago, I began thinking I should start to familiarize myself with keeping a firearm prepared for defense. I have no fear of using it because I live in a nice area in a high rise with a doorman (not as posh as it sounds) but plan on moving in the near future and want to start learning and getting comfortable with keeping firearms ready for defense. 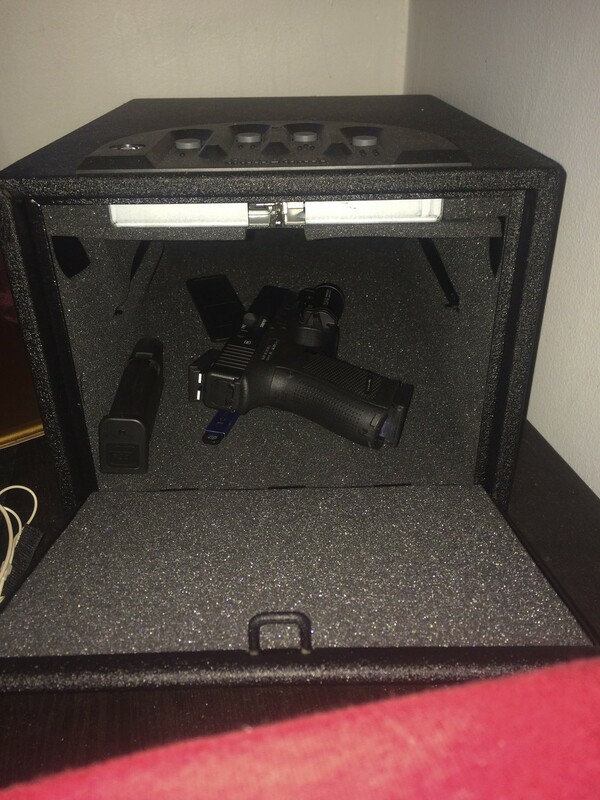 I've been looking at similar bedside safes for a while, yet the price tag kept me spending money on more guns, ammo, and accessories, instead of something I would hope to never need. While waiting for my background check to clear, I was looking around my LGS and saw they had a sale going on their Gunvault products. At first, I picked up the Minivault and got home, programmed it, and began dry fire practice utilizing drawing from the safe. I'm a big guy, and my mitts just were not working well with the Minivault. I went back to the store and returned it to purchase its bigger brother, the Multivault. Multivault is possibly referencing not only the ability to store multiple handguns, but also a variety of items. The biggest draw was the gaping maw of this thing. The nice wide opening allows easy access to draw your firearm quickly and snag free from a multitude of angles. When this thing opens, it OPENS. The door is spring loaded and retained in the locked position when unlocked, the latch lets go, and that strong spring slams the door open, yet it buffered by rubber pads on the base, as to not mar whatever this is placed on or affixed to. As far as entering your code, this safe utilizes a four button system that allows you to press one or all buttons per entry and use 3-6 entries. Basically, your code could be to press all four buttons 6 times but, that doesn't seem like a wise idea. While you shouldn't enter all 4 buttons 6 times, this allows for a greater variety of entries and a more secure combination. I have now begun training with this, and it's a snap to pick up and adapt it to your defensive needs. If my living situation ever deemed it necessary, I would surely pick up another one, or two, of these as needed to adequately cover my home. The underlying thing I find important that sometimes people overlook, is to make sure whatever you are running works for you. Sometimes, price is a factor, but if I hadn't spent the extra 40 bucks for this bigger model, I would have a 20 lb striking implement as my hand was stuck inside. Claim to Fame: Accessible defensive firearm, and valuables storage. Target Market: Anyone looking for a convenient and secure means to store a defensive handgun. What other aesthetic options or finishes are available? : Minivault is the exact same thing but smaller, there are also biometric options. What others are saying? : Check out the Amazon reviews averaging 4/5 stars. I need it now! Availability: These can commonly be found at local sporting goods and gun shops. When it comes to practical combat sights, there are many options out there. 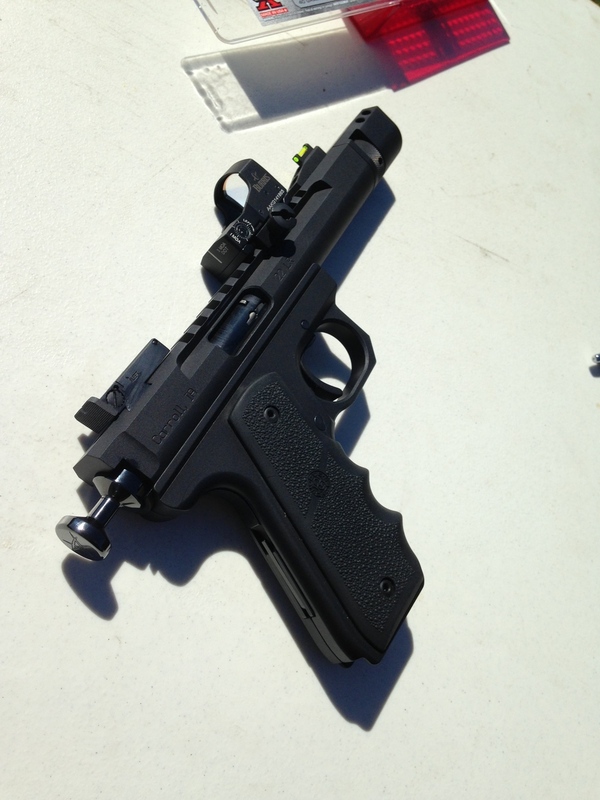 I found out about these Aimline sights from a friend and got in contact with the guys at KA Tactical. In short order, I had sent off, and got back, my Glock 19 slide and got to testing. I found in my friend's Glock 19 that it is a pistol I shoot instinctively well, so I bought it (not to say he regrets selling it but he wants another one). This is due in part to the ergonomics and natural pointability it affords me. I also fell in love with the ball in the cup sight picture that came with the gun, but was not thrilled with plastic construction, so I was hesitant to make the change, but eager to upgrade. These Aimline sights feature all steel construction, which is a durability and utility upgrade over the stock Glock sights. The sight picture is another thing that drew me to these sights over other sights that feature three dot style sight pictures. The Aimline system works great for me, because the principle of the straight line formed by both the colored lines on the sights and the sight housings themselves create a sight picture that is both easily acquired and equally maintained through continuous fire. I firmly believe that beauty is in the eye of the beholder, when it comes to sighting systems across all weapons platforms. 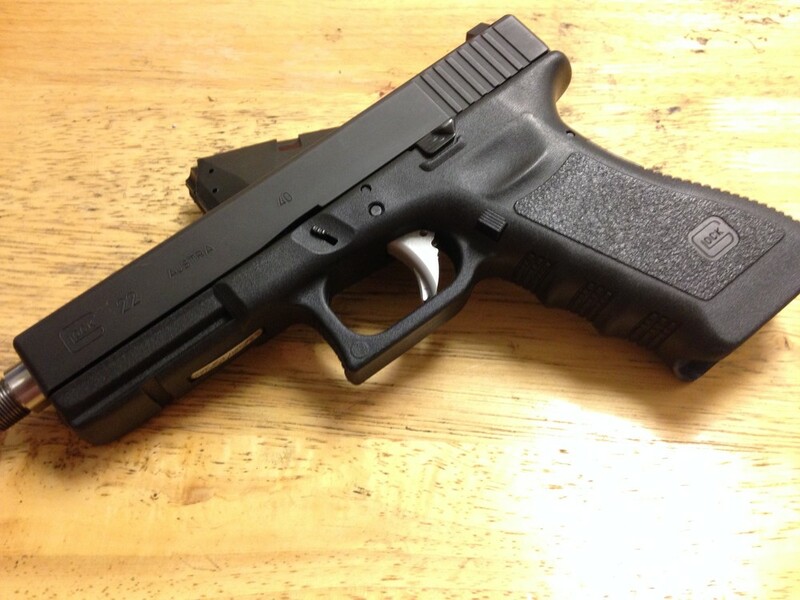 The defensive handgun in particular benefits from a simple easy to acquire and consistently maintained sight picture. The value and strength that these Aimline sights provide, are definitely worth checking out. I am so pleased with these that If I dont go with an RMR on my new Glock 41 Gen 4 I know exactly what I will be putting on. In the included video you can see these in action by me and my friend running some practical shooting drills. Claim to Fame: No nonsense combat sights. Designed to be snag free while maintaining belt/shoe racking. What other aesthetic options or finishes are available? : White, Yellow, Green, and Orange color options are available. What others are saying? : The Truth About Guns did a review on these sights here. Retail = I got mine from KA Tactical and they did the install. I need it now! Availability: I have not seen these locally yet but with modern shipping you can get them pretty fast even if you send your slide to have the work done. Not unlike other popular polymer striker fire pistols, the S&W M&P has factory internals that are meant to be a common denominator for all gun owners. While it's perfectly satisfactory for most gunsumers, Apex Tactical manufactures Action Enhancement Kits, or AEKs, to suit your competitive, duty, or carry needs. The Apex Tactical Duty/Carry Kit & AEK Trigger are two products I was recommended to add to my S&W M&Pc pistol to give the already decent performance and accuracy a bit of a "polish." The Duty/Carry AEK kit is compatible with S&W M&P Full Size, Compact, Long Slide and Pro Models, with or without thumb safeties and magazine disconnects. It is not compatible with the M&P Shield or .45ACP M&P pistols. The kit includes an APEX fully machined sear, APEX M&P Ultimate Striker Block Kit (Ultimate Striker Block, USB Spring, Talon Tactical Tool) and Duty Carry Spring Set (Sear Spring, Trigger Return Spring, aluminum slave pin). All those modiciation parts work in conjunction to shorten over-travel of the trigger and create a smoother pull, all while keeping the pistol at a safe 5-5.5 lb trigger pull weight for Duty/Carry applications. I know many of you have heard/read already the saying, "You don't want to have to explain to a prosecutor in court why you modified your defensive weapon with a lightened trigger" but there's a reason why all LEO and military keep their sidearm triggers in the 5lb range, and for a non-competition pistol you plan on using for personal defense its a good idea to follow step. The AEK Trigger Kit is compatible with all S&W M&P Pistols including the 45 ACP models. It directly replaces the factory hinged trigger with a solid body machined aluminum trigger (a lower price polymer trigger is also available) that has a center mounted pivoting safety. The flat target style trigger purposefully forces the shooter's finger on the center line of the trigger and encourages trigger manipulation directly to the rear, which leads to better accuracy. The reduced pre-travel and over-travel is approximately a 20% difference from the S&W factory trigger. I found that installing the Duty/Carry Kit was fairly straight forward when watching the Apex Tactical instructional Youtube video (Part 1 and Part 2). The only hangup I had was connecting the AEK trigger to the trigger bar. Despite being preset from Apex, it refused to budge for me. In fact, I broke a cheap punch on it after wailing repeatedly with far too much force than what should have been necessary. I had to use a bench vice to start the pin even more, which was then too far for the trigger bar to be attached. A quick visit to the gunsmith took care of it, and he was in agreement that the pin in question was unusually stubborn. After installation of both the AEK Trigger Kit and the Duty/Carry kit, I found that the trigger pull was indeed very smooth and the distance for both pre-travel and over-travel were much shorter than before. The reset however disappeared almost completely, and will take some getting used to at the range as it feels like a competition trigger. I was able to bump the trigger and get unintended double taps, but installing the Reset Assist Mechanism (RAM Kit) next should reproduce a proper reset and an overall safer carry pistol. I would recommend these kits to any M&P owner who is wanting a better trigger pull and tighter groups. It does take some getting used to, and if you have never disassembled a striker fired pistol beyond whats needed for cleaning I would recommend either taking it to a gunsmith or studying up on the Youtube videos repeatedly before taking it on yourself. Claim to Fame: The AEK Trigger is an enhanced trigger for the Smith & Wesson M&P Pistols, reducing trigger pre-travel and over travel. The Duty/Carry Action Enhancement Kit delivers a smooth, consistent 5½ lb. trigger pull with less over-travel and shorter reset for an improved performance of your pistol while maintaining its safety features for daily carry. Retain the factory sear spring to get a slightly lighter 5 lb. pull. Both kits engineered for a drop-in fit, though gunsmith installation is recommended. Shorter over-travel and shortened trigger reset. The kit itself is engineered to be drop-in and should not require further gunsmithing (however, armorer or gunsmith installation is recommended). The kit itself is engineered to be drop-in and should not require further gunsmithing, however AEK trigger pin was unusually stubborn and needed persuasion from my smith. Trigger reset is not tangible and barely audible, Reset Assist Mechanism is probably needed to finish off the kit for my carry purposes.